One mitered square measures 11". -Finished Size: 47” long and 47” wide. -Yarn: Schoppel Wolle Gradient (100% merino wool; 284 yd 260 m/3 1/2 oz 100 g): #1878 gradient, 8 balls. -Needles: Size 6 (4 mm): 32” circular (cir). Adjust needle size if necessary to obtain the correct gauge. -Notions: Removable marker (m); tapestry needle. 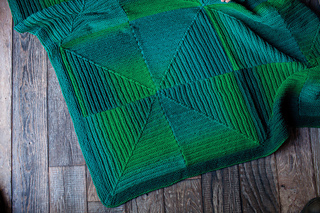 The squares that make up this cozy afghan can be assembled in any direction, making the miters line up contrast. Finishes to be four squares by four squares.